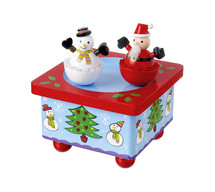 Up for grabs today is a Orange Tree Toys - Wooden Christmas Music Box for 1 lucky winner thanks to Grand Baby. Grand Baby is a site that sells unique and special items that are ethically produced/sourced, traditional, high quality, innovative and original. 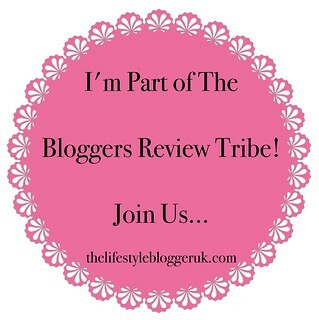 They sell a range of toys, gifts for baby, gifts for Mum, personalised gifts, books, clothing & accessories and much more. One of my favourite products on the site is the Wooden Jungle Baby/Nursery Mobile from Orange Tree Toys. 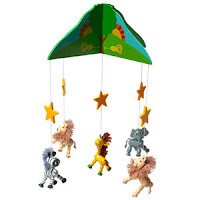 It is a gorgeous, colourful mobile with little zebras, lions, giraffes and elephants hanging from it. At £12.99, this would make a beautiful addition to your baby's nursery. 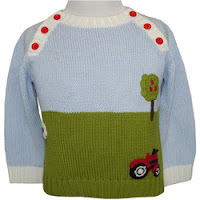 I also love this gorgeous Powell Craft Hand Knitted Farmyard Jumper which is available on Grand Baby. It is lovely and so unique - beats what you buy on the high street any day. You can buy this jumper in a variety of sizes - from newborn up to 2 years old. I just love the little tractor design. At just £19.99, this is excellent value for money. Some of their most popular items are their nursery prints and the rag dolls for older children. You can view the full range of products at www.grandbaby.co.uk. You can also get the latest new from them on Facebook and/or Twitter. The Nurse Ragdoll as she's got such a sweet face. Ah, that is so lovely. A real treasure to bring out every year. My favourite is the Teddykompaniet Gingerbread Man Soft Toy, he's adorable. I love the farm jumper, my little grandson Jake loves tractors. I've knitted him a similar jumper, but it doesn't look as good, I'm not the world best knitter, but he looks really cute in it. Nurse Ragdoll appeals to me.